Tandoori roast chicken requires little prep for great flavor. Ever since my parents came to England in 1972, my mum has had a wild love affair with roast chicken. The only thing she loves even more is her family and unfortunately for her, my dad is a vegetarian. So for 41 years now, her opportunities to turn the oven on, throw caution to the wind and put a beautiful bird in to roast have been limited. She’s simply too loving a wife to torment my dad like that. That’s why every Mother’s Day, there is only one thing that we will cook: tandoori roast chicken. But this isn’t just any old roast chicken; it is one worthy of a feast. It has all the merits of a normal roast chicken, flavorful crispy skin, butter-soft meat and largely fuss-free prep, but it is much more elegant and celebratory. The chicken is made tender with a marinade of yogurt and lemon juice, then enlivened with earthy cumin, garam masala, ginger and garlic. Once the ingredients have been blended into a paste, all that’s needed is a quick rub down and rest (the chicken, not you) before it goes into the oven, leaving you free and out of the kitchen. It’s the only time of the year we force our father into the kitchen to help with the sides (supervised, of course). But given that there are plentiful greens around this time of year, they are quick and easy, too. 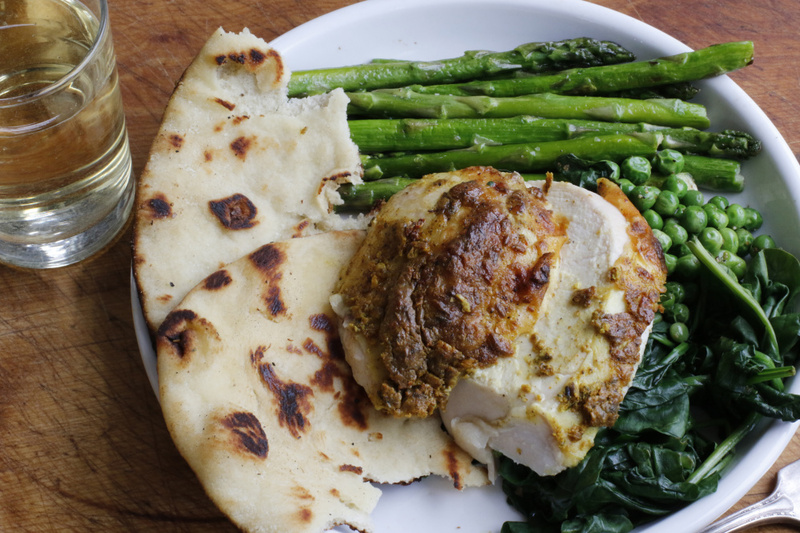 We love to serve this with spring’s finest asparagus, peas and spinach, a little lime pickle, toasted naan bread and some crisp white wine. All of this fuss-free cooking allows us more time for a relaxing family lunch together. Until we need to tackle the washing up, that is. You will need a blender to make the marinade. I like to marinate the chicken first thing in the morning to give it time for the flavors to mingle. Line a roasting pan with foil, then place the chicken in the center. Combine all remaining ingredients except the yogurt in a blender, then puree until reduced to a fine paste. Mix in the yogurt. Rub the yogurt mixture over all parts of the chicken, then refrigerate and allow to marinate for at least 30 minutes and up to several hours. When ready to cook, heat the oven to 350 F.
Roast the chicken, not covered, on the oven’s middle shelf for 40 minutes. Baste the chicken with any juices in the pan, then lightly cover with foil. Roast for another 40 minutes, or until the meat reaches 170 F at the thigh and 165 F at the breast. Remove the chicken from the oven, leaving it covered, and set aside to rest for 15 minutes before serving.